My brief respite in August from the long commute to school is officially over. I find myself once again printing out PowerPoint lectures, making flash cards in my spare time, and hauling myself three towns over to join in with that odd mixture of people one only finds at a community college night class. The good news is that I only need to attend a live class once a week. The bad news is that this class is Nutrition. Like many of you, I am deeply interested in the field of nutrition. Furthermore, there are some important aspects of a primal diet that converge nicely with mainstream nutritional advice (such as eating lots of fruits and vegetables. But I must say that it does get frustrating after a while to find that a substantial amount of research and evidence that suggests an alternate perspective on grains, saturated fat, processed foods, cholesterol, insulin, etc. is ignored or dismissed without any explanation. It is not my personality to be ‘that person’ who likes to argue with the teacher. So I just sit back and try to tell myself that all knowledge is useful. My instructor is a perky marathoner who may or may not be getting all of her lecture notes from the health articles in Cosmo. “Today we’re going to talk about eating disorders, guys! This lecture is soooo much fun. Do you want me to tell you about the skinniest woman I ever saw” I don’t mean to be unkind. She’s probably a really nice person. One point in her favor is an interesting assignment she gave to track our food intake for 4 days and turn in a nutritional analysis. This provided a convenient opportunity to take some pictures and compile yet another “what I ate” post. So without further ado, here’s what I ate. Today I will be posting my daily menu followed by some of my favorite quotes from my nutrition textbook. 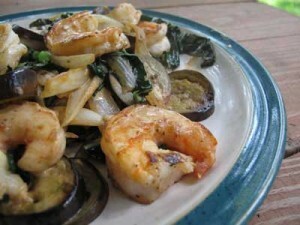 Shrimp stir-fry with eggplant, onions, kale in coconut curry sauce. Mini Baybel (I love these things! Braised beef with chili flavors over sauteed, grated cauliflower, cabbage and carrots. 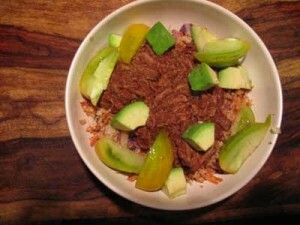 Topped with avocado and heirloom tomato. Your comment about the soda made me laugh Shelley! I’m extremely interested in nutrition and pursuing a degree in this field, but I don’t know that I could stand studying all of the conventional wisdom taught in “nutrition” classes now-a-days. I’m very curious to see how you handle this:). Thanks for all the great recipes & posts! In your abundant free time (LOL), would you mind posting quick-and-dirty instructions for your amazing lunch you have there. I know you can simply whip something like this up intuitively, but I am new to cooking… and it doesn’t come easily to me. I admire how luxuriously you eat and how simple you make it seem. Great cooking and looks very tasty! 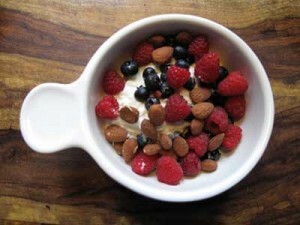 Especially the shrimp stir fry…..Your breakfast looks very similar to something I often do: A base of Cottage Cheese or Quark covered with berries and pecans/almonds really tasty and quick….. I too would have trouble not speaking up multiple times in that class! Your meals for today sound tasty, I’m jealous! Ginger, my ‘everyday’ coconut curry is as easy as it gets and tastes heavenly (or at least I think so). Step 1. Mix about 1/3 can coconut milk with a teaspoons or more of red curry paste, depending on how spicy you like things. You’ll find this paste in a small jar in the Thai section of the grocery store. Step 2. Cook up your protein on the fry pan in a little oil, set aside. Step 3. Clean the pan and cook up your veggies. Consider staggering them… like start off with onions and tough veggies like carrots, broccoli and end with quick-cooking stuff like spinach. I also like to throw in some fresh grated ginger and garlic at the end. Step 4. Add the protein back in, pour in the sauce, let it sizzle for a moment. Transfer to large plate and eat! I also find it helps to have my protein ready to go or else it all sounds like too much of a bother. For example, I bought 2lbs of beautiful shrimp on sale at Whole Foods and peeled, deveined, and froze them in 5oz portions. This way I can grab a portion out of the freezer in the morning and they are ready to go in the pan by lunch. I’m glad I wasn’t drinking my coffee while I read this, or I would’ve spewed it when I read the part where your instructor “may or may not have” used Cosmo as her inspiration. Too funny. And yet too sad and too true. I love your menu and thanks for the tip on the shrimp curry…gotta try that! Arrgh, how frustrating! And how difficult it must be to sit there with your mouth shut! I wonder what your instructor will say about your 4-day food diary. Shelley, I found myself just cracking up as I was reading this post. I am an RN with a Master’s in Nursing and extremely interested in Nutrition. I follow the primal lifestyle as closely as I can. I am very curious about your experiences in this Nutrition class, especially your instructor’s comments about your food diary when you turned it in. I would imagine you had some interesting conversation. I know I can get in to some pretty good disagreements with some of my physician colleagues and basically “agree to disagree”. Would love to hear more when you have time. I got my paper back and while I got full credit, there were no comments. I strongly suspect that she did not actually read it but glanced through to be sure that the basics were covered. I noticed others in the class flipping through their returned papers looking for comments to no avail. She also didn’t comment on them to the class as a whole. Michelle – I don’t know if you’ve read my little bio but I am working towards a nursing degree now. I also plan to get my masters. I can imagine some of the conversations you must have!